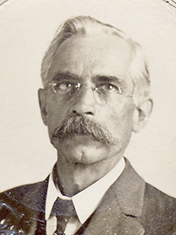 Anton Rokos (1861-1916) was an installer and the first curator of the Spreckels Organ (1914-1916). He arrived in America from Germany or Austria-Hungary in 1891. Rokos worked for organ builder Phillip Wirsching in Salem, Ohio, and the Farrand & Votey Organ Co. in Detroit. In 1903 he began working for Murray M. Harris Organ Company in Los Angeles. His assignments included selecting trees from the forests of Oregon for pipe wood. Rokos remained with the firm until 1913 when the business was sold and the factory moved from Los Angeles to Van Nuys. Rokos helped install the Balboa Park organ along with Edward Crome, who had worked with Harris from 1898-1904, at which time he opened his own business in Los Angeles as representative and installer for the Austin Organ Co. Crome and Rokos began their work at the exposition grounds in 1914 once the Pavilion to house the organ and its 3,400 pipes was constructed. The Pavilion structure included a tiny apartment in the space provided for the longest organ pipes. Here Anton lived for most of the time he was installing the organ and during his continued work as its first Curator. The single room was drafty and had no heat or running water. Anton contracted tuberculosis in 1915, complicated by pneumonia during the very damp winter of 1916. Though critically ill, Anton continued his work to keep the organ functioning to its enormous capacity. On February 9th, 1916, a worker in the Pavilion found Anton, collapsed from sickness and exhaustion, at the foot of one of the ranks of pipes. He died later the same day. …details courtesy of Ken Rokos, great grandson of Anton Rokos, and Jim Lewis.